I intend to complete this game very soon. 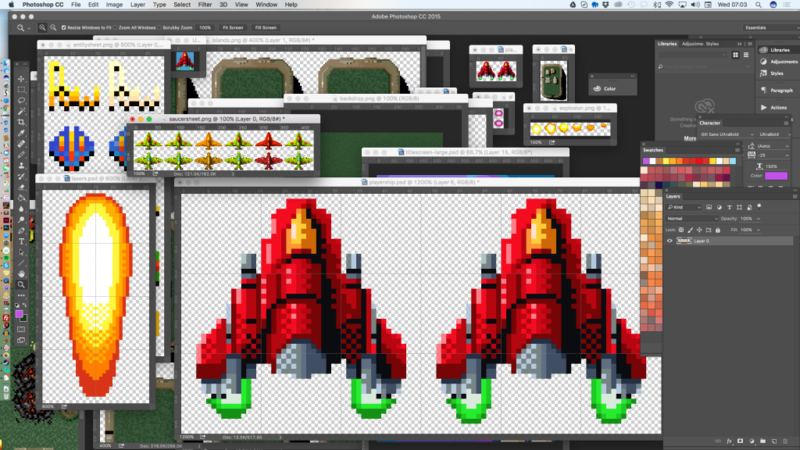 I confess I’ve got a little carried away adding some special effects with sprites. The shards of metal that fly away from the damaged vehicles when struck with a missile or gun fire were just too tempting to resist. I spawn them in the game with random trajectory, speed and spin rate. The effect is pretty neat. For the most part the metal shards whizz off the screen but occasionally you get a slower shard that just ambles off screen with a slow spin. It really adds to the impression of blasting everything to pieces. Hope to have the game completed over the Christmas break in time for new year. Yet despite this I now find myself in that unavoidable “crunch” mode on two projects. I also set a target to finish these two projects by the new year. A laugh at it now but I shelved my first project as it approached completion to pursue a fresh project. It was of course a diversion. I was deliberately avoiding the pain of that final 10% that takes an agonising amount of time to complete. Now I have doubled the pain! The discipline of developing arcade games has evolved and tightened over the years to become almost formulaic. This in itself isn’t always a good thing but it can be useful to have a blueprint for design when it comes to balancing, testing and code fixing. There’s just not enough to challenge me here. The player character moves too quickly to be threatened by the bad guys. The bad guys need to target the player more. There’s too much room to move. The player isn’t developing any skills in his movement and bullet / entity dodging! I kid you not. This was a recent note I took. The beauty of all of this is that everything in the game is defined by numerics. The player’s movement is defined as a speed parameter that allows his co-ordinates to increment each tick. Similarly the other objects in the game perform against the same calculations. In the driving / shooting game (which I currently call Road Rage) the room in which the player has for movement is defined by the road object’s width and height. I applied a .nextthink attribute to the road container which ticks down every game tick. At zero I make another decision on how to scale and move the road. With this method I can shrink or expand the road with ease after an elapsed amount of time. As a result of my testing and observations above I could see that the road needed to narrow more frequently. The player’s car going “offroad” results in a lot of damage and consequently Game Over so a shrinking road is a real challenge to the player. As you can see in the screenshot the road is divided up in to slices. Each “slice” is an object that contains parameters for the ground texture, the road, the road’s verge and the lines that run down the middle. The only artwork on display per slice is the ground and verge. The other two elements are solid colour blocks. The tree decorations that overlay the ground are sprite objects and behave in a default sprite behaviour. i.e. emerge off screen, run the length and disappear without any collision detection. Developing the shifting road wasn’t really much of a challenge. You could almost imagine the process as a series of around a dozen rectangular cards placed in order. By altering the x position of each road object as it is spawned off the top of the canvas (and subsequently allowing the object to increment its y co-ordinate) you can create a satisfactory rippling effect that simulates the shifting road. The road width (the solid colour area) is known and therefore I can plot x co-ordinates for the overlayed verges. 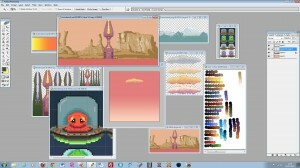 For a long time in the early days of development I was playing the game and struggling to find a core mechanic for it. That vital element of the game that forms the player’s goal or goals. I knew that arming a sports car with rockets and allowing it to shunt other vehicles off the road would be fun, but as always I wanted an intensity to the action that meant there would be a ton of rockets and bombs on the screen. This can cause design problems in terms of setting a challenge since firing a huge amount of rockets and lasers only works if the stuff you’re aiming at is destroyed! It’s no good if the targets just bounce around a bit and are unaffected by your gunfire. So I dabbled with all sorts of mechanics including collecting valuable items and avoiding oil slicks. They just didn’t work. The thrill of the game is in its pace and causing the car to spin or forcing the player to swerve and collect items just didn’t add up to very much fun. It needed to be a high octane experience with shooting, dodging, turboing and explosions set against an underlying need for speed. So I fired up Out Run for a little inspiration. A wonderful game from the 1980s in which you drive a car at speed across an undulating terrain whilst avoiding other road users. The game is divided in to stages such that when you cross a checkpoint you are rewarded with a little more time to play. This did it for me. It was obvious. A game in which you drive a car has to be a challenge of beating the clock. I could still get away with blasting the bad guys I just needed to ensure that the core goal was to complete each stage in a set amount of time. Adding a timer was simple. I set it to 30 seconds initially and ticked down every second. At zero the car exploded and the game was over. So the next question was how do I speed the car up and slow it down without having specific controls overlaid on the touchscreen. This was a no-brainer. I implemented a turbo accumulator. The destruction of cars and military vehicles spawned turbo collectables that bounced around the screen. By collecting several of these the player built up their turbo bar sufficiently to engage a short (10 second) turbo mode in which the car’s speed doubled. The faster the car the quicker the player zoomed through each stage. So there was plenty of incentive for the player to destroy the other vehicles and go collecting the turbo shards. But this wasn’t enough of a challenge. I wanted to add an element of dodging to the game so I stuck with the idea of the other vehicles launching missiles at the player. One hit and the car was destroyed! 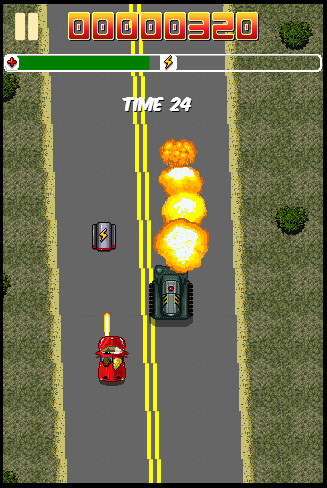 Unlike off-road damage or bumping the other cars, missile damage didn’t reduce the player’s “health”. It just wiped them out. So I’m now confident that I have the game that I was after. As I play it now it’s pretty close to the original design and with the injection of the pulsating soundtrack and over-the-top sound effects I think it’s easily the best arcade game I’ve made to date. I look forward to sharing it within the PlayStar Arcade shortly. 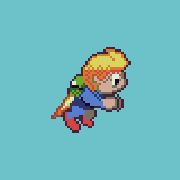 Jet Boy (or Super Jet Boy to give it its full title) is a game about a boy with a rocket pack who embarks on an adventure to recover some mystical golden statuettes. High above the kingdoms of his homeworld a series of enchanted sky temples play host to an array of weird monsters charged with one simple task – protect their master’s golden treasure. Jet Boy has no special powers. 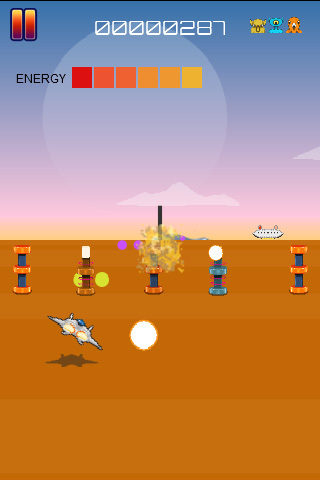 For once I resisted the urge to load my game character up with bombs & lasers and throw explosions around the screen. All I wanted with Jet Boy was a simple case of learning how to control a character with a rocket pack. Much of the work in creating the game was already written thanks to my work on Crossfire. I pretty much lifted most of that logic when constructing Jet Boy and adapted it to respond to gravity and bi-directional movement. The real challenge in developing the game was in the control of the main character. I knew that I wanted movement in all directions and also the concept of thrust to lift the character higher up the level. When no thrust was applied (either through no screen press or lack of fuel) the character would simply fall until they reached the base of the level. At this point the player would be looking for bonus ballons carrying fuel to re-enable the rocket pack. So how do you acheive all of this without using on-screen buttons in a touch screen environment? 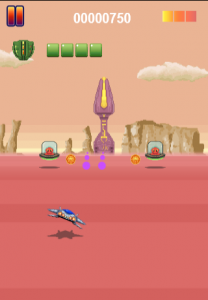 The obvious conflict was in the distinction between simply touching the screen to move the character and touching the screen to apply thrust to the rocket pack. As soon as I tap the screen both would apply. I may only want to shift the character from left to right in a horizontal fashion but by virtue of the fact I’m touching the screen the rocket pack would fire and the character would raise. I initially figured this would be acceptable but the moment I fired it up it was anything but. In fact it was maddening. So I set a new attribute on the player object that essentially ticked down to zero. At zero the character would start to rise. It’s a kind of pre-thrust thrust if you like. The player touches the screen, the ticker is set, the rocket pack engages, the ticker begins the count down, a second or so later the ticker hits zero and there is enough thrust to enable the character to rise. If the player releases the touch before the ticker hits zero the ticker is forced to zero. This worked quite well as it allowed for a reasonable amount of horizontal movement before the character started to rise up the screen. To aid this I deliberately set horizontal motion to be very loose. In other words when the player slides his finger quickly across the screen the character zips left to right (or vice versa) at speed. As usual when you implement this kind of thing to solve a problem you are often treated to a few surprises. One such surprise was in how nice it felt to have the character free-falling down the level and gaining speed through gravity, only to have that descent cut short in a smooth fashion thanks to the application of thrust. There is no fancy physics engine beneath all of this it is simply a case of fine tuning the numbers until I’m happy with the results. Finally I would like to mention here that to achieve the smooth motion I deal a lot in floating point values. i.e. 1.2345 rather than 1. This affords a decent amount of granularity. 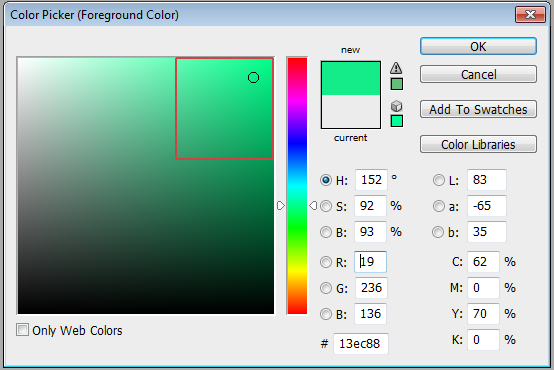 But when it comes to drawing on the screen using context.drawImage() I cannot apply those floating point values to the x/y co-ordinates of the sprite. The result is a blurry mess of a sprite. To combat this I simply round the figures down to the nearest integer with Math.round() / Math.floor() — round up and round down respectively. All of my sprites contain an ‘angle’ attribute so rotation occurs on each sprite regardless of whether the angle is always zero. So that’s it. The game is still very much in development and I’m spending a healthy amount of time enjoying the process of designing levels. When the game is complete it will be available through the usual portals and of course Mozilla’s MarketPlace. Just a quick update as work on Crossfire (previously Stargun) is moving at pace just now. I’m very keen to use the project as an exercise in broadening the featureset of my game framework. 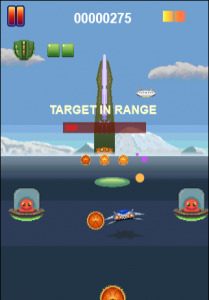 Currently I’m focusing on creating the kind of vertical shoot ’em up that was popular around the late 80’s and early 90’s. The sort of game that you might have played on an Atari ST or Commodore Amiga. I didn’t personally own either machine as this was a period in my life when I didn’t do much with computers – parties, playing in a rock band and girls were far more important :) – so this is very much an exercise in researching the games of the day via YouTube & VGMuseum, buying a few old magazines and firing up emulators. It’s a huge amount of fun and the results are proving to be very exciting. I’m still using a 2 pixel brush as a hang over from the previous game. 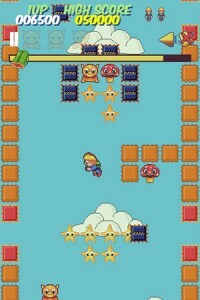 I rather like the pixellated style of the artwork that is produced and may continue the theme through a few more games. Drawing with a bigger brush in Photoshop is a lot of fun ! So the features of the game are pretty established. The in-game level editor / structure allows me to define a JSON map of the level and then iterate through based on a pre-defined delay. As the code ticks through the level row by row a new set of obstacles / bonuses / enemies / power-ups is spawned just off the top of the screen and moves slowly in to view and off down the screen. 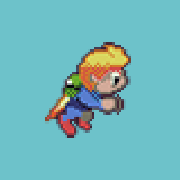 Based on the sprite’s type and class it will then animate, glide, blink on and off, shift left and right, rotate, be destroyable or simply shoot at the player. The combinations available to the level’s designer are huge ! I also took the decision to have the player’s fighter move instantly with the touch. In River Raider I implemented a kind of drag effect. As you slid your finger across the screen the plane drifted in to position. A kind of drag effect. I think it worked for that game and gave you a little more to think about. But in Crossfire I wanted the movement to be instant. It’s a mobile game so to enable this functionality and still be able to see the fighter sprite I register the first touch on the screen and move the fighter relative to subsequent touch co-ordinates. This really is the correct way to control your on-screen fighter / character. Too many times we see a virtual joypad and it really doesn’t work. So currently I’m designing the enemy and toying with the idea of using a pre-rendered scrolling backdrop rather than just the trenchlines that I detailed in an earlier post. The game has a distinct feel and character which I think (hope) the retro shooter enthusiasts will enjoy. It also has some cool sound effects courtesy of the Buzz JS Audio Library. Getting this to work across the board on mobile is flaky so ultimately I think the audio will be a desktop feature. 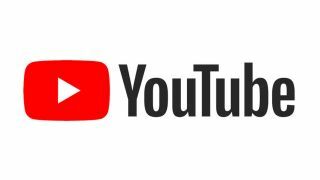 But big things in mobile audio are on the horizon so watch this space. Hoping to complete the game within a couple of weeks and push it to PlayStar (mobile only) shortly after. As always the game will be available for licencing on a non-exclusive basis. I’ve been working hard to create the visuals for Distant Orbit this last week. I know how much I enjoy looking over other developer’s workstations so I thought I’d capture mine and post them up here. I’m still undecided on the use of cartoon aliens. I like them but I’m not sure if it’s right for this game. The 2nd alien world in action with a half completed “monument valley” style backdrop. I use a Wacom tablet and Photoshop to create the artwork. Initially I use a broad pencil – 5px in width – and then I go dotting with a 1px pencil to create the finer details. An early rendering of the energy tower on Tranquis – planet #1. I wanted each planet to have its own theme and style. This is the first planet and I wanted it to feel quite welcoming with the blue hues. The snow-capped mountains seemed to work well here and I love the completely alien tower as it rises from the horizon. 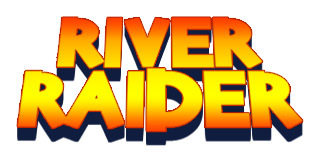 My HTML5 take on Activision’s classic River Raid is almost complete and it’s been a huge amount of fun. The beauty of the original game was, for me at least, in it’s slick execution. I loved the way the plane rolled left and right and accelerated the more you held the stick. I also loved some of the neat little touches like having a tank approach the bridge rather than simply destroying a bridge. There was a tremendous sense of achievement and satisfaction in timing your shot such that you took both bridge and tank out. As with my earlier games I never simply carbon copy the original game. I don’t see the point. For me it’s about taking some elements, throwing a few new ones in there and crafting a cool new game from it. My inspiration for River Raider was actually in part Capcom’s classic 1942. I had always loved the way that game played and have tried to implement a few of its cool features in to my own game. So what does River Raider give you ? How will the game play ? In short it’s a straight shooter where the levels are actually bumped with every bridge that you destroy. There’s all the usual suspects: planes, boats, choppers and land to avoid (although I let the player hug the river bank – I felt that was a bit too tight on a touch screen game) and at the end of it a bridge to knock down. Rather than one shot to destroy the bridge I decided to build the bridge in sections. So you get to destroy the bridge bit by bit. I rather liked it when I first put it in and it’s stuck. All of the adversaries will fire back at you. The farther you progress the more frequently they will shoot. 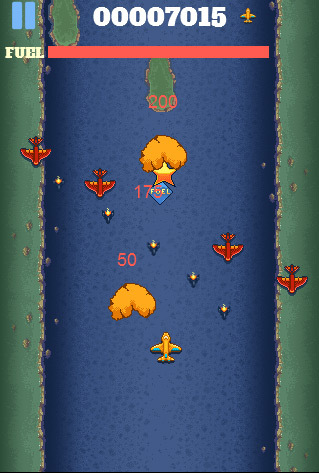 In addition I have planes attacking from the top of the screen. 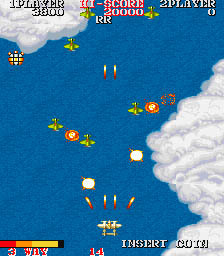 To ease you in this is initially just a single jet fighter that launches its bombs towards you as it passes. Later you’ll see a kind of death formation of jet fighters that come at you in a number of patterns and launch missiles your way. Tricky ! There’s really nothing too complex about implementing the attack waves since the sprites are given a default downward behaviour that is modified to either float left or right depending on a flag when they hit a certain area of the screen. 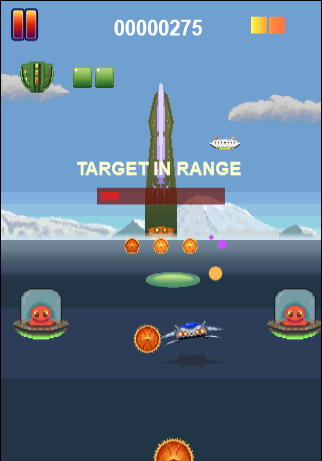 To improve the effect I perform sprite rotations depending on which direction the planes are heading. My HTML5 game system handles this with no fuss and it adds a huge amount to the appeal of the game. 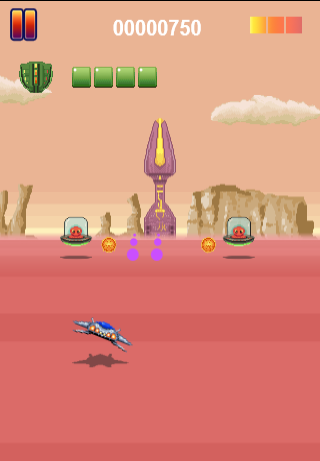 Just now I’m in a phase of balancing the firepower of the player’s fighter with the attacks that are thrown at him. I’ve opted to have 4 attack styles just now for the fighter. A standard solitary bullet, double bullets, 4 bullets that fan out and then 6 bullets per shot that spray from the plane. I’d like to try and add some missiles as well. What this means of course is that the enemy are simply cannon fodder so I need to up the ante a little on their part. 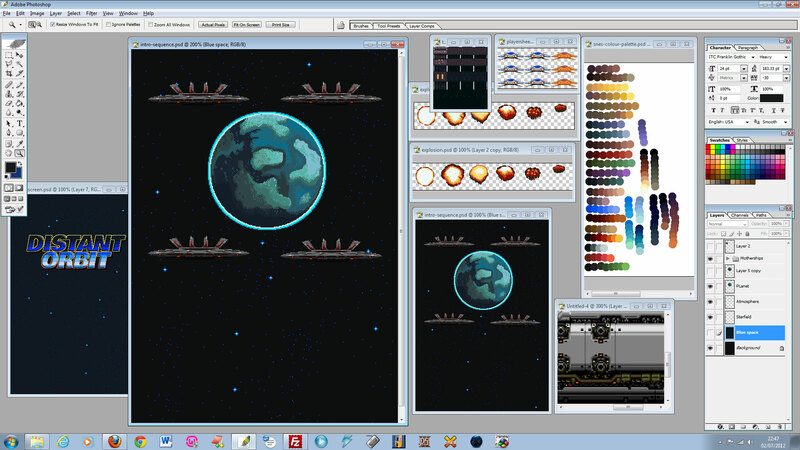 Right now I’m toying with the idea of a boss stage. Or atleast a stage that involves gunning down an enemy with a different AI. I plan on having this game completed shortly after the Easter break. I thought it might be worth briefly sharing my approach to handling grid movement. It’s by no means finalised but just now is giving some very satisfactory results. In every game that I make I employ a fairly basic box based method for collision detection. In reasonably fast paced arcade games where the sprites are deliberately designed to fill the box this really isn’t a problem since gamers won’t notice a couple of pixels in error. Besides I always weight the collision routine in favour of the player where relevant. 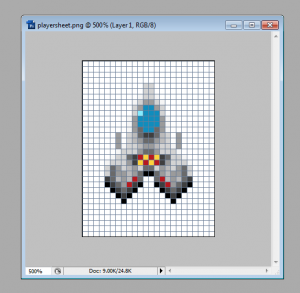 The game is laid out on a 10 x 15 grid of 32 x 32 pixel blocks. The blocks are actually sprites since I want to animate them (i.e. 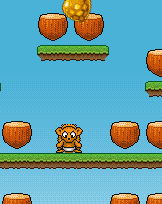 cycle through animation frames, move in to position on level load, resize and move during the game). But unlike all other sprites in the game I won’t be using the standard collision routines. At any given moment in the game the player will be either a) sat at a precise location that can be converted in to a grid reference or b) in transit between two grid references. This is the key to my handling of wall collision. The graphics above should illustrate these points. In illustration b) the player has swiped the screen to initiate movement. 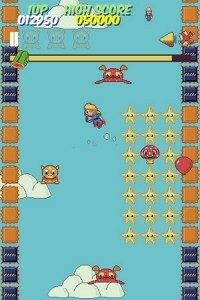 The game recognises the fact that the player sprite is currently not moving ( m.player.moving = false ) and is therefore cleared to attempt movement. But first we perform a test by translating the player sprite’s x,y co-ordinates in to a grid reference. We can now determine which way the player wishes the sprite to travel and test the corresponding grid location to see whether a wall is sat in the way. We can perform this test against the leveldata array that stores our wall locations. You can see more on this in the blog post I linked to above. So fairly basic so far. If a wall is in the way the move request is rejected – see below. Player sprite is sat at grid 4, 1. He wants to move to 5, 1. A quick lookup on the leveldata array shows us that for element 1 of the leveldata array there is an “+” sat in position 5. See below. Where the fun begins is in the handling of new direction requests once the sprite is in motion. A couple of things need to happen here. First I need the player’s sprite to just keep going until a wall is hit. My sprite walks at 8 pixel increments so moving from grid location A to grid location B takes 4 steps. This is a deliberately short timeframe between grid points. It is important for me that the player is able to register quite frequently by way of a swipe on the screen an intended next direction. This intended next direction is stored and when the player’s sprite falls perfectly in to position at the next grid reference I test this new direction instead of the actual direction. If the new direction fails the sprite just carries on on its prefered course until a) a new direction request is received or b) it hits a wall. Of course at any point in transit the player has the freedom to “turn his sprite around”. There is nothing to stop this since the game is testing for precise locations the sprite will just fall back in to a previous grid location. So finally a word on what happens with the other objects in the game. Monsters will follow the same code path as the player sprite. When they hit a wall they will make a decision based on their definitions. In most cases I expect that the monsters will “hunt” for the player since this is where the challenge should be. But in some cases I will completely randomise things such that the monster will quite happily retread his footsteps. This should add enough of a mix to the game to keep the player guessing. Other entities such as gems, powerups, bonuses, magic weapons etc will be initially placed by the leveldata definitions but will actually be tested for collision against the player using my standard collision routine. That way I am free to move the sprites around the maze if I wish. So that’s it ! Nothing overly complicated at all. Of course this is all just theory written here. I’ve not posted code since the code isn’t finished. Once it is I’ll revisit some of this.